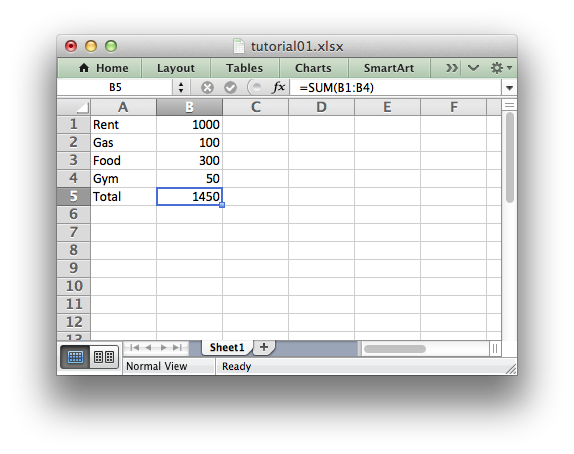 Let’s start by creating a simple spreadsheet using Python and the XlsxWriter module. This is a simple example but the steps involved are representative of all programs that use XlsxWriter, so let’s break it down into separate parts. The next step is to create a new workbook object using the Workbook() constructor. XlsxWriter can only create new files. It cannot read or modify existing files. worksheet1 = workbook.add_worksheet()        # Defaults to Sheet1. worksheet2 = workbook.add_worksheet('Data')  # Data. worksheet3 = workbook.add_worksheet()        # Defaults to Sheet3. Throughout XlsxWriter, rows and columns are zero indexed. The first cell in a worksheet, A1, is (0, 0). And that’s it. We now have a file that can be read by Excel and other spreadsheet applications. In the next sections we will see how we can use the XlsxWriter module to add formatting and other Excel features.